Like many other allergies to fresh fruits and vegetables, pear allergy can take two different forms. In the North of Europe, people with birch-pollen allergy can develop a pear allergy due to the similarity between a protein in birch that causes birch-pollen allergy and a pear protein. This is called the birch-fruit syndrome with symptoms generally appearing within 5-15 min after consuming raw pear and comprising local reactions in the mouth and throat with itching and inflammation (called oral allergy syndrome, OAS). The molecule, known as an allergen, involved in this kind of allergy does not survive cooking. 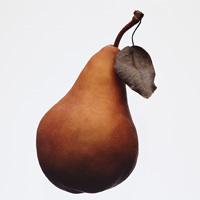 Therefore, people who react to this allergen can tolerate cooked pear. Individuals often develop adverse reactions to other fruits including apple, apricot, cherry, melon, banana, nuts such as hazelnut, or vegetables such as celeriac (celery tuber) and carrot. In Mediterranean countries, people with pear allergy do not have birch-pollen allergy. Instead they often have allergy to peach. Symptoms are more severe including generalised urticaria, abdominal pain, vomiting and life-threatening symptoms, sometimes in addition to the OAS. These individuals tend to have more frequent and severe reactions when fruits are eaten with the peel. They also tend to develop adverse reactions to other fruits including apple, peach, apricot, plum, cherry and nuts (such as hazelnut and walnut). The allergen that causes this kind of allergy is tough and the allergenicity survives in processed foods such as juices. As a result, individuals with this kind of allergy cannot eat even cooked pear. Extracts and recombinant Pyr c 1 and Pyr c 5. Extracts were prepared as follows: Pieces of fresh fruit were frozen with liquid nitrogen and ground in an analytical mill. The plant material was transferred into pre-cooled acetone, homogenized, and stored at -20 °C overnight. The precipitate was washed twice with acetone (-20 °C) and once with a mixture of acetone and diethylether (1 : 1, v/v, -20 °C), filtered and lyophilized. Then, the freeze-dried acetone powder was extracted with 0.15 m NaCl/0.01 m NaH2PO4 pH 7.4, the supernatant was centrifuged, passed through a glass fibre prefilter, and either freeze-dried or stored at -20 °C until used. (Karamloo et al. 2001) . (Karamloo et al. 2001) . EAST and histamine release (Karamloo et al. 2001)  (Karamloo et al. 2001) . 16 patients allergic to birch pollen and with allergic symptoms after ingestion of fresh pears (Karamloo et al. 2001) . All sera had a positive EAST (> 0.35 U·mL -1) to pear extract and the recombinant major pear allergen, rPyr c 1. All sera but one had IgE specific for rPyr c 5. Recombinant Pyr c 5 triggered a strong, dose-dependent mediator release from basophils of a pear-allergic subject (Karamloo et al. 2001) . Fifteen (94%) of the patients had a positive EAST for pear extract, and all showed IgE binding to rPyr c 1. Dose-related histamine release experiments were undertaken in two patients who were allergic to birch pollen and pears. The response to allergen stimulation showed the same ranking in both patients, as graded by the protein concentration required to stimulate a histamine release of 50%. This concentration was highest for pear extract protein (0.05–0.1 µg/ml), and about 10-fold lower amounts of rPyr c 1 were required to elicit the same effect (Karamloo et al. 2001) . The proteins were electroblotted to a nitrocellulose sheets with pore size 0.2 µm. The sheets were cut into 5 mm strips and blocked with phosphate-buffered saline pH 7.5 with 0.5% (v/v) Tween 20 and 0.5% (w/v) bovine serum albumin for 30 min. Strips were incubated with diluted (1:4 v:v) sera overnight. The IgE-binding components were detected with iodine 125–labeled rabbit anti-human IgE antiserum. Blots were visualised by autoradiography (Ebner et al. 1995) . A total of 84 DBPCFC were performed in group A patients (21 subjects) with 33.3% of positive results showing oral allergy syndrome after challenged with pear fruit . 33.3% of patients with a positive SPT were also positive when challenged (Florido Lopez et al. 2002). Karamloo, F., Wangorsch, A., Kasahara, H., Davin, L.B., Haustein, D., Lewis, N.G., and Vieths, S.
Pyr c 1, the major allergen from pear (Pyrus communis), is a new member of the Bet v 1 allergen family. Process, chemical, enzymatic:This is not known, but it is probably that like other Bet v 1 homologues in fruit, Pyr c 1 is destroyed on cooking. IgE cross-inhibition studies between Pyr c 1 and Bet v 1 indicate the presence of common epitopes (Ebner et al. 1995)  (Karamloo et al. 2001) . The deduced sequence of Pyr c 1 shares a high degree of identity (57%) with Bet v 1 (the major birch pollen allergen) and with the family PR 10 pathogenesis related proteins. Consequently Pyr c 1 may have a role in plant protection against insect pests and microbial pathogens (Karamloo et al. 2001) . There is experimental evidence that Bet v 1-homologues, eg Pru av 1 from cherry, are plant steroid carriers (Neudecker et al. 2001) . Recombinant Pyr c 1 has been purified using a heterologous expression system, E. coli, as a His tag fusion portein and further purified by metal chelate affinity chromatography (Scheurer et al. 1997)  (Karamloo et al. 2001) . Scheurer S, Metzner K, Haustein D, Vieths S.
Molecular cloning, expression and characterisation of Pru a 1, the major cherrry allergen. Cross-reactivity and epitope analysis of Pru a 1, the major cherry allergen. There are only few studies on the stability of profilins most of them on celery profilin. Compared to other allergens, profilin is a moderately stable protein, more resistant than Bet v 1 homologues to thermal treatment and proteolysis but less stable than lipid transfer proteins or cross-reactive carbohydrate deteminants of glycoprotein allergens. Scheurer S, Wangorsch A, Nerkamp J, Skov PS, Ballmer-Weber B, Wuthrich B, Haustein D, Vieths S.
Cross-reactivity within the profilin panallergen family investigated by comparison of recombinant profilins from pear (Pyr c 4), cherry (Pru av 4) and celery (Api g 4) with birch pollen profilin Bet v 2. Pyr c 5 and Bet v 6 share 80% amino-acid sequence identity. IgE cross-reactivity between both allergens has been demonstrated by EAST inhibition experiments (Karamloo et al. 2001) . These authors also suggested that homologous allergens may be present in many vegetable foods such as apple, peach, orange, lychee fruit, strawberry, persimmon, zucchini (courgette), and carrot. Allergen properties & biological function:Pyr c 5 is a phenylcoumarin benzylic ether reductase and it might be involved in plant defense (Gang et al., 1999) (Karamloo et al. 2001) . Allergen purification:The recombinant protein was expressed as His-Tag fusion proteins in Eschershia coli and purified by Ni-chelate affinity chromatography under native conditions. (Karamloo et al. 2001) . The theoretical pI of Pyr c 5 is 5.9 (Karamloo et al. 2001) . Allergy to latex, avocado pear, and banana: Evidence for a 30Kd antigen in immunoblotting.